It's been a while since I've done a review. I've been a busy bee working on my next book. My crit partner Cole Gibsen had a talk a few weekends ago and she talked about a YA book with a great opening. 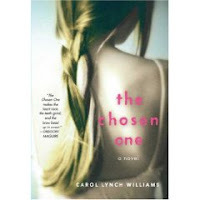 The book was The Chosen One by Carol Lynch Williams. I'm so glad she told the audience about the book. The opening is spectacular. Matter of fact, the whole book has great pacing and by the end I was like wow, I won't forget this book. What I loved about this book was how the plot propelled me forward. I cared about and wanted to know what happened to the heroine, a thirteen year-old girl named Kyra. Kyra lives on Compound with her father and his three wives. The Compound is the home of a conservative, polygamist community where girls are married off at a young age and they often become a wife to an older man with multiple wives. During the story, Kyra is told that she has to marry her sixty year-old uncle and become one of his many wives. The idea of doing such sickens her. Especially since she has given her heart to one of the young men in the Compound. She also longs for the things the community had before their zealous leader instituted more stringent rules. No more books. Young girls were to be married to the men the leader chose. Even if they didn't want to marry them, they would be either beaten or killed. The story is full of shocking moments where I cringed and covered my mouth. It's these shocking moments that make the story rich and forces the reader to think about what might be out there in the world. Are there people who think and treat children in this type of manner. I won't spoil the story to tell you what happens to Kyra, especially since I want you to read it, but I highly recommend this book. When I enjoy a book I read it quickly and this one took me a day or two. Definitely worth your time. I'd give this book a solid grade of an A. It's so good it's traumatizing!